A Sweet Easter With Less Sugar! And #honibeSweet TWITTER PARTY! I've noticed that every major holiday is swiftly become a "candy" holiday like Halloween. The kids love this, but it so unhealthy for them, especially when moderation is difficult. I don't want to be a candy scrooge, but some boundary has to be drawn. My kids on sugar are like rockets, blasting through my house with thrusters set to maximum. This year we'll be making up a healthier Easter basket for the kids, using kids honibe honey gummies complete multi-vitamins. Kids honibe honey gummies are made from 50% less refined sugar. My kids describe the 3 flavours as "like gummies, only stronger"
It's important to start early to create healthy routines, including daily exercise, nutritious and moderate eating, and the introduction of a daily multi-vitamin such as honibe. Yes, honibe also makes an adult honibe honey gummies complete multi-vitamin for mom and dad! honibe also makes tasty "honey delights" candies, made with pure dried honey. At 10 calories each, they would make a great tea sweetener for mom, and are prewrapped for the purse. They are round, and slightly grainy in a pleasing way. Follow honibe on Social Media! 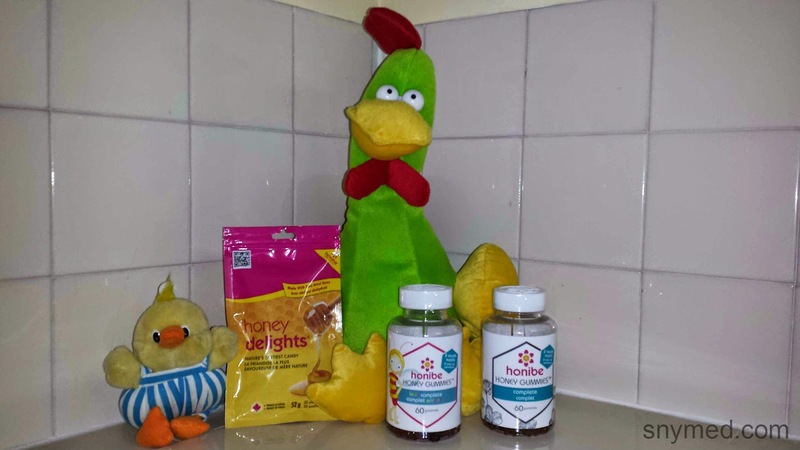 "We all know honey is sweet, and what is even sweeter are honibe products! Join Jenna Em from SnyMed.com on Wednesday April 1st as we chat all things health, honey and buzz about the bees!" PRIZING: to be confirmed. GOOD LUCK! RSVP: Twitter Party participants must RSVP below to win a prize. All are welcome to join the #honibeSweet Twitter Party, but prizing is only open to Canada. I haven't tried this product before. I'll have to look into it. I love the option of gummy vitamins. When they taste great the kids don't know the difference. I used to tell my son they were fruit snacks and he loved them. When I was little we always got a few treats, a new outfit or shoes as well as some chocolate. I am trying to do the same. We love honeydelights! Great products. Wow I have never heard of Honible before. Since we have cit all refined sugars out of our diets Honible Sweets sound like a good idea to have on hand! Thanks for sharing Jenna! Yes, the candy for every "holiday" thing is getting annoying to me as well. I try not to allow too much candy into the house, if the kids are going to get a treat they get my healthified version instead and usually it's much better anyway ;) I must try these honibe vitamins! They sound super yum! That's a great idea, I try to match a little chocolate with a gift. I have tried their vitamins and they are amazing!